Monterra is the first full-featured Wi-Fi enabled GPS device that combines great Garmin Outdoor GPS competence with the versatility of the Android operating system. Monterra integrates the robust and versatile Android OS into a reliable and durable, feature-packed, handheld GPS device. It provides outdoor professionals and enthusiasts with the ability to customise their GPS device to perfectly suit their personal and professional needs, even better now they can take their apps everywhere no matter how tough the environment may be. Monterra features an outdoor optimised highly durable mineral glass display. This transflective display uses the power of the sun to provide the best readability in any situation and even in brightest sunlight. This way it saves power throughout the day as the LED backlight only needs to be turned on in low light conditions. The Android operating system empowers users to access all their favourite outdoor-related Android apps and discover even more for the next adventure, through the Google Play Store directly onto the Monterra. They can also access professional apps (e.g. for farming or logging) to improve their daily efficiency in the field. One of the most popular recreational outdoor apps in Europe, PeakFinder Alps, is even preinstalled on the Monterra and tells you the name and height of the mountains around you. The modern dual battery system of Monterra has been specially developed for prolonged outdoor deployment all around the world. You’ll have the option of conveniently charging the included lithium-ion pack inside the unit or flexibly switch to traditional AA batteries which are easy to get, just in case. 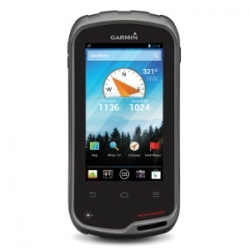 This way Monterra provides great GPS performance up to 22 hrs on one battery charge. Monterra deploys leading sensor technology, thanks to its high-sensitivity, dual-band GPS and GLONASS receiver, Monterra finds its location quickly and maintains signal lock even in heavy cover and deep valleys. To even further improve positioning, it has a built-in 3-axis compass with an accelerometer and gyro, which indicates the user’s direction when standing still or not holding the device level. Once calibrated, its barometric altimeter has the ability to track changes in pressure to pinpoint your precise altitude, and it can also plot barometric pressure over time too, which can help you to keep an eye on changing weather conditions. A built in UV sensor lets you know your exposure level to sunlight so you can avoid sun damage, especially at higher elevations and on bright or reflective surfaces. Monterra includes a built-in 8 megapixel autofocus digital camera that takes vivid, geo-tagged photos for easy return navigation plus a 1080p HD video camera with LED flash/torch. Then download easily to your computer or share via Garmin Adventures. Monterra has plenty of internal memory plus a microSD™ card slot for up to 64 additional GB of memory. Monterra also has a built-in FM radio which you can listen to with headphones. With Wi-Fi, ANT+™, Bluetooth® and NFC, Monterra lets you share your data, maps, waypoints, tracks, routes and geocaches up to 50 times faster with other wireless compatible devices. Plus, you can share large files like photos and data from field work through BaseCamp™ or by downloading it directly to your computer. Adding other Garmin maps to Monterra is easy. Load BirdsEye Select and hit the trail. Add one of the great Garmin Topo maps and explore the wilderness with the best mapping data available for the region or load up your GIS-based maps and go to work. No more picking, choosing and planning, just download them all. The Monterra can hold millions of geocaches. Download every cache on OpenCaching.com. Load caches from GSAK or use your favorite Android app. All your paperless geocaching features will be there for every cache. Read full descriptions, hints and logs. View cache photos. Filter caches by size, terrain, difficulty and type. Connect to chirp™-enabled caches. Monterra is the ultimate mapping tool with custom 3-D mapping, which lets you combine 2 maps - like Topo, basemap or BirdsEye Select imagery - then view the new unique map in 3-D complete with visible “texture,” such as hills, valleys, lakes and forests. For example, combine BirdsEye with your shaded relief basemap. Then zoom in, pan out and rotate the 3-D map using multi-touch. Take charge of your next adventure with BaseCamp, software that lets you view and organise maps, waypoints, routes and tracks. This free trip-planning software even allows you to create Garmin Adventures that you can share with friends, family or fellow explorers. BaseCamp displays topographic map data in 2-D or 3-D on your computer screen, including contour lines and elevation profiles. It also can transfer high quality raster map tiles to your device when you purchase BirdsEye Select or Birdseye Satellite Imagery.